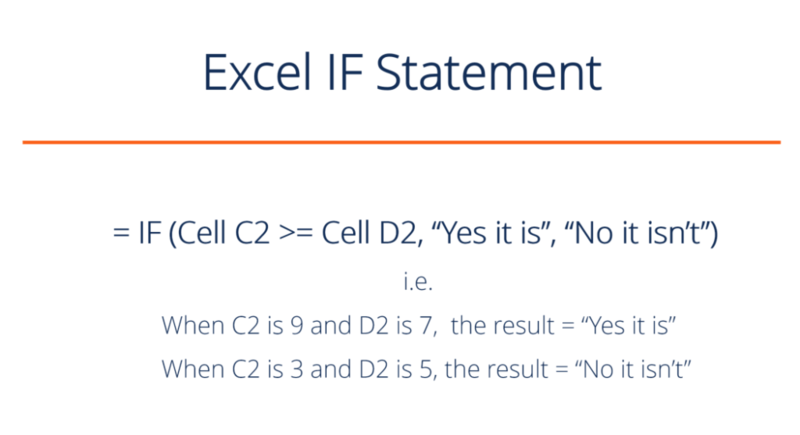 What is an Excel IF Statement? 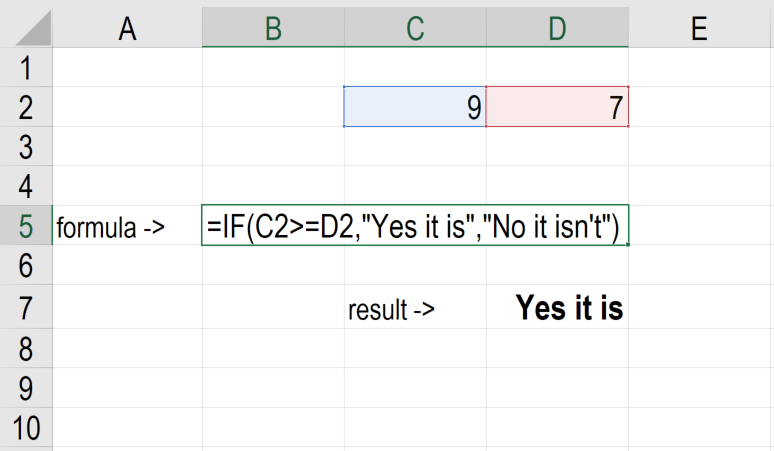 An Excel IF Statement tests a given condition and returns one value for a TRUE result, and another value for a FALSE result. For example, if sales total more than $5,000 then return a “Yes” for Bonus, otherwise, return a “No” for Bonus. 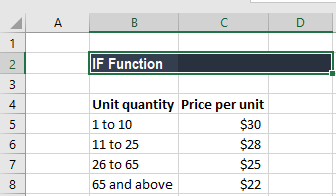 We can also use the IF function to evaluate a single function or we can include several IF functions in one formula. Multiple IF statements in Excel are known as nested IF statements. As a financial analystFinancial Analyst Job DescriptionSee a real Financial Analyst Job Description including all the skills, experience, and education required to be the successful candidate for the job. Perform financial forecasting, reporting, and operational metrics tracking, analyze financial data, create financial models, the IF function is used often to evaluate and analyze data by evaluating specific conditions. The function can be used to evaluate text, values, and even errors. It is not limited to only checking if one thing is equal to another and returning a single result. We can also use mathematical operators and perform additional calculations depending on our criteria. We can also nest multiple IF functions together to perform multiple comparisons. Logical_test (required argument) – It is the condition to be tested and evaluated as either TRUE or FALSE. Value_if_true (optional argument) – It is the value that will be returned if the logical_test evaluates to TRUE. Value_if_false (optional argument) – It is the value that will be returned if the logical_test evaluates to FALSE. How to use the Excel IF Function? Suppose we wish to do a very simple test. We want to test if the value in cell C2 of greater than or equal to the value in cell D2. If the argument is true, then we want to return some text stating “Yes it is”, and if it’s not true then we want to display “No it isn’t”. 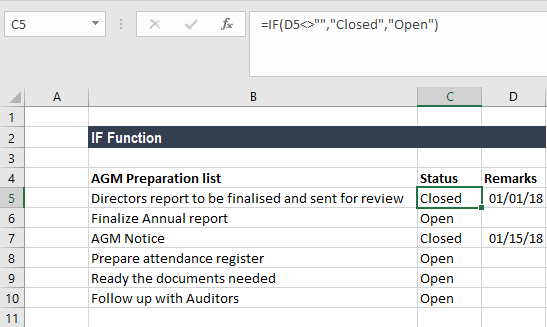 You can see exactly how the Excel IF statement works in simple example below. Download the simple XLS template. 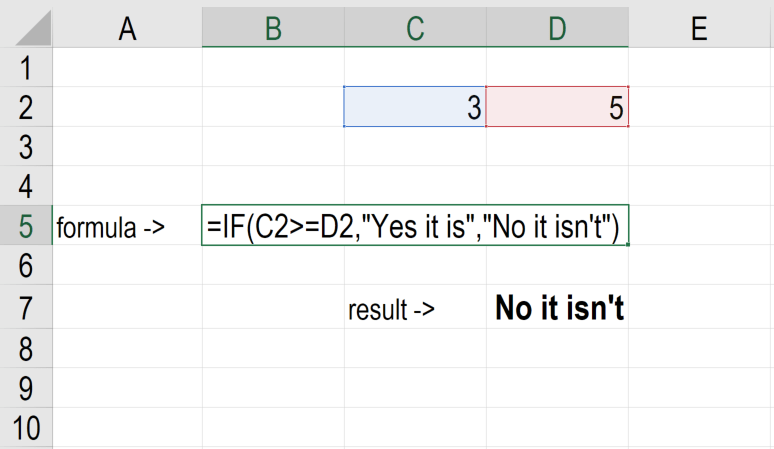 The Excel IF function will work if the logical_test returns a numeric value. In such case, any non-zero value is treated as TRUE and zero is treated as FALSE. #VALUE! error – Occurs when the given logical_test argument cannot be evaluated as TRUE or FALSE. When any of the arguments is provided to the function as arrays, the IF function will evaluate every element of the array. If we wish to count conditions, we should use the COUNTIF and COUNTIFS functions. If we wish to add up conditions, we should use the SUMIF and SUMIFS functions. There are many reasons why an analyst or anyone who uses Excel would want to build IF formulas.